The Tower of London is the main fortress of the British capital, located on the banks of the Thames. Built at the end of the eleventh century and modified twice during the following centuries, it reached us in a very good state of preservation as it was at the end of this second wave of modifications. 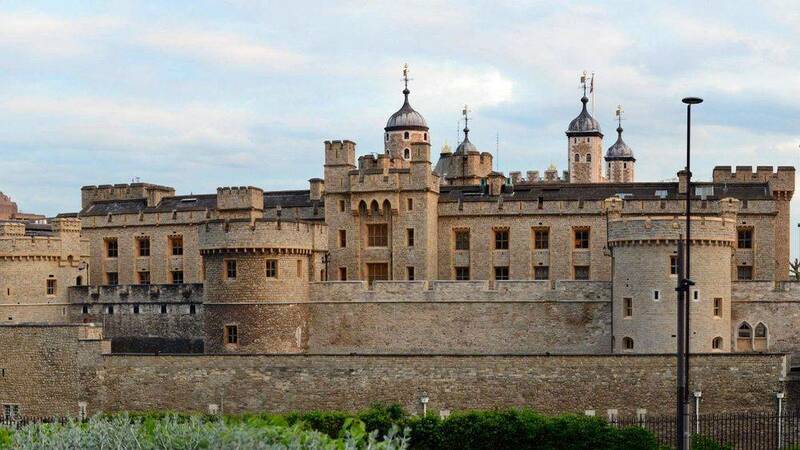 The tower of London is, above all, a large keep, the white tower, the Waterloo barracks which nowadays contain the famous jewels of the crown, and two rows of ramparts bristling with towers. The Tower of London, seen from the South, by the Thames. 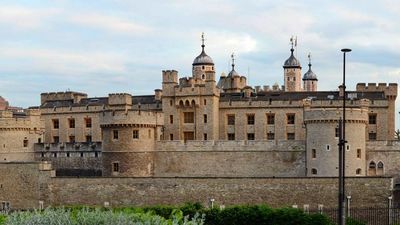 The whole of the Tower of London is 4.9 hectares, it forms an irregular hexagon included in a rectangle of 240m by 210, plus an advanced double-turn that controls the entrance. The whole citadel is surrounded by a large ditch which has been drained, with a thick first rampart (except the south side, where it is finer) and a second rampart equipped with towers. Inside this double enclosure is the main building, the dungeon (here called the white tower because of the color of the decorations), the Waterloo barracks containing the crown jewelry room, the quarter general of the fusilliers which houses a museum, the royal chapel and other lesser-known buildings: the hospital, the workshops, the Queen's apartments, etc. The Tower of London is a fortress hard to take. It has moats, two concentric walls and numerous protection towers. On the north side the outer rampart has only two massive towers (20m in diameter, about), one at each angle. They are called Legge Mounts (in the West) and Brass (in the East). On the west side there are no towers except the Byward tower which controls the entrance, and of course the middle towers which are in front of the entrance. The south side faces the Thames, protected by the St. Thomas Tower and two smaller ones, the Cradle Tower and the Well Tower. Finally on the west side the only protection tower is to the south, it is the Develin tower. On the other hand, if the outer wall has only a few towers, the inner ramparts have much more, especially on the north side. They are all connected by a walkway that can be taken today to visit all the fortifications. 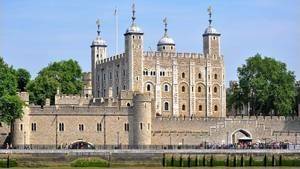 As it is a fortress, there are a large number of buildings to the Tower of London, the main being probably the keep. 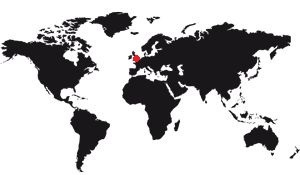 Here is the list of the main places to know, with a link for each of them to their description. 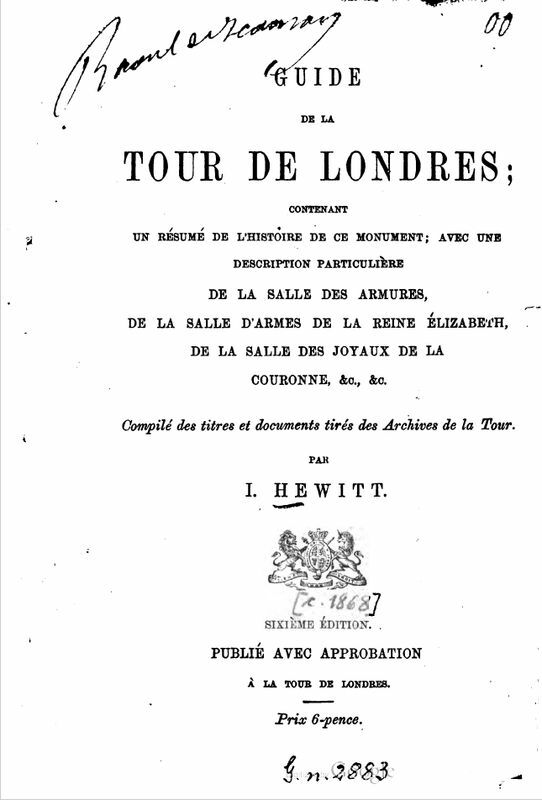 This text is that of a certain Hewitt, it was written in 1868 in a book, the "Guide to the Tower of London". He describes this monument with the eyes of a visitor of the time. If writing is a little obsolete most of the texts are still current. We can still detect some differences between the situation of the time and the current state of the Tower of London, especially on the presence of the "guns that command all the avenues of the tower". We also note the presence of the "very recent" Waterloo barracks, since it was built in 1840. Nowadays, it seems to us much older. 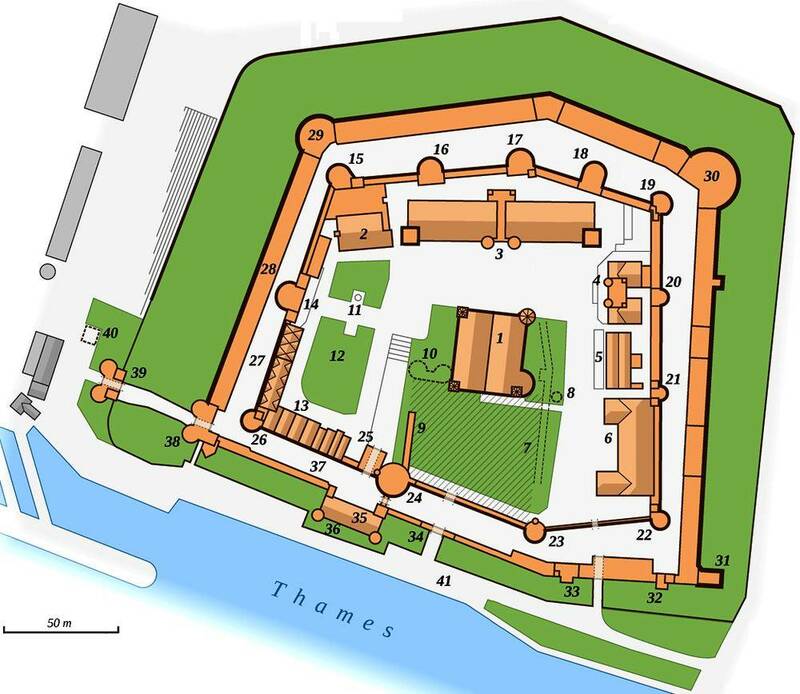 This fortress is located on the north bank of the Thames, west of London. Today, it was still in the nineteenth century at the end of the city, and the western plots were occupied by the Wharfs. The fortress covers 12 acres (4.9 hectares) of land and is surrounded by a ditch. The great wall carries, from distance to distance, along the entrenchments, the cannon-guns which command all the avenues of the Tower. The interior of the fortress contains several private houses, a church, shops, etc. The Tower is separated from the Thames by a part of the ditch and a platform from which one has a beautiful view of the river. There are two entrances: the main one is to the south-west of the buildings. It has two doors on the other side of the ditch, which a small stone bridge crosses, and a third door beyond the ditch. To the right of the west gate was the Lion Tower, built by Edward IV, formerly occupied by the royal menagerie. The Byward Tower is circular in shape. It is said that Queen Elizabeth was confined in this tower, which now depends on the apartments of the governor of the fortress. At a short distance from it, one sees the Traitor's Gate, so named because it was there that the prisoners of state were brought in before. The Bloody Tower, where Edward V and his brother, the Duke of York, were said to have been smothered by order of their uncle, the Duke of Gloucester. Since then, we have been talking about the legend of the two princes. Entering the inner enclosure by the door of the Bloody Tower, one is at the foot of the White Tower. It is a massive, quadrangular building, the largest and oldest part of this fortress. It is crenellated, with a turret at each corner. The walls are over 4m thick. The building consists of three high stories, under which there are rooms, which served as prisons. On the second floor there is a beautiful remains of the Norman architecture, the chapel of St. John, in which the ancient kings devoted their devotions. Another room in the White Tower served as a Council Chamber. The rooms below the building were so many prisons, the walls of which still bear inscriptions which the victims who were imprisoned there wrote. Besides the chapel of St. John there is another in the fortress, built during the reign of Edward I, and consecrated to St. Peter. It is a simple monument which is interesting only for having served as a place of burial for a great number of famous persons, and for the victims of the execrable tyrant Henry VIII. It is here that the unfortunate Anne Boleyn, Queen Catherine Howard, Bishop of Rochester, Jean Fisher, Thomas Cromwell, Countess of Salisbury, the last offspring of the Plantagenets, Edward Seymour, Duke of Somerset, Thomas Howard, Duke of Norfolk, Lady Jane Gray and her husband, Lord Guildford Dudley and the famous Earl of Essex, favorite of Queen Elizabeth. Close to this chapel is the Beauchamp Tower, which has long served as a state prison. It is composed of two storeys, its walls bearing testimonies of the misery of those who were locked in it. Among the illustrious persons imprisoned in this tower are Queen Anne Boleyn, Lady Jane Gray, Jean Dudley, Earl of Warwick, Philippe Howard, Earl of Arundel, Charles Bailly, agent of Mary Stuart, Sedbar, Prior of Joreval, and Robert Dudley, Earl of Leicester. The governor's house, building of the time of Henry VIII, is south of the Beauchamp Tower. In the north-east, the Develin tower, from which, according to what is said, was communicated by subterranean passages to the vaults of the chapel of St. Peter. To the east of this tower are the remains of three other towers: the Flint tower, the Bowyer tower, and the Brick Tower. 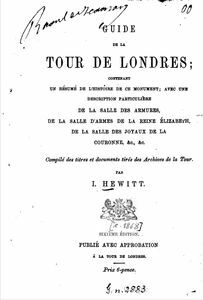 It is said that Lady Jane Gray was imprisoned in the latter, and the Bowyer Tower is said to have been the scene of the death of the Duke of Clarence, who was drowned in a cask of Malvoisie. It was in a workshop on the same tower that the fire that destroyed the Great Arsenal began in 1841. Further on is the tower called the Broad Arrow Tower: it has also served as a state prison. The salt tower offers nothing interesting, except an inscription engraved by a tavern master, who was imprisoned there in 1560 accused of sorcery. In the Wakefield Tower there is a beautiful octagonal hall where it is said that Henry VI was assassinated. This tower is called Wakefield because it was the place of detention for prisoners at the Battle of Wakefield. North of the White Tower is a large late 19th century building that serves as a barracks for a garrison that can be quite large. It occupies the ground where was formerly the Great Arsenal, destroyed by fire in 1841. This Arsenal was 105m in length by 18 wide, and consisted of two main apartments. In the first there was a collection of cannon, some of which were remarkable for their antiquity, others for their construction. The upper room usually contained rifles for about 600 men: they occupied the center of the apartment. On the walls were seen an infinite number of ancient weapons of all kinds. The destruction was complete: only a few pieces of cannon were saved, which are now to the west of the White Tower. The damage amounted to 250,000 pounds sterling at the time. This building now houses the Crown Jewels Hall.